Original Monster Cable. 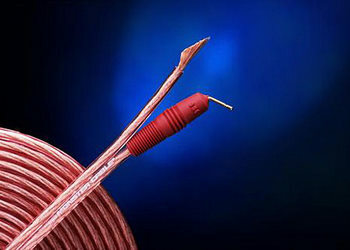 Illustration courtesy of Monster Cable Products, Inc.
How much can a reviewer write about speaker wire? To judge by the outrageous articles that have appeared in the audiophile press, apparently quite a lot. Therefore, I thought I would try it, in a more genteel, refined (and truthful) manner, of course. "Rock or classical, analog or digital, Monster Cable makes all your recordings come alive. There's more 'punch' to the sound. Smoother highs, a tighter bass, and a clearer midrange. With greater clarity, you'll hear details you never heard before. Most exciting of all, you'll experience better depth and imaging – creating a more 'live' and natural listening experience." Some of these audiophile (perhaps better spelled "audio-fool") speaker cables are incredibly expensive, costing hundreds, thousands or even tens of thousands of dollars. Yes, you read that correctly, and I am not kidding or exaggerating. For example, according to Audioquest's 2010 price sheet, a pair of 15 foot Audioquest WEL Signature speaker cables terminated in spade lugs costs $37,600. These are not, by any means, the most expensive speaker cables on the market. "Wait a minute," the scientifically inclined among you exclaim, "speaker cable is just a piece of wire shorting the output of an amplifier to a speaker terminal. How could a piece of wire have any 'musical' qualities?" My answer is, "Beats me." Therefore, to cut through some of the advertising and marketing BS surrounding what used to be a straightforward subject, I will share in this article the sum of my 40 years of audiophile experience: speaker wire has no sound of its own; it is just a connector! 12 gauge (AWG), two conductor, stranded copper, speaker wire (line cord) will serve very nicely for almost any home stereo application. It will also serve just fine for most professional sound reinforcement applications. It is, in fact, widely used by professional sound system installers. For shorter runs, 16 AWG stranded copper wire is fine. In fact, for short runs, such as you would use in most dorm rooms, studio apartments or pleasure boats, 18 AWG lamp cord will suffice. I have used all of these, but today I recommend 12 AWG for all home stereo speaker connections, regardless of length. It is easier, not to mention better, to standardize on 12 gauge wire. According to the table for two conductor copper wire given in former Director of Acoustic Research for McIntosh Labs (and the originator of McIntosh loudspeakers) Roger Russell's online article "Speaker Wire, A History" (http://www.roger-russell.com/wire/wire.htm), 18 AWG is satisfactory for maximum length runs of 32 feet when connecting eight-ohm speakers. The maximum length for 16 AWG wire is 48 feet and for 12 AWG speaker wires the maximum length is 120 feet. Halve those distances if you are using four-ohm speakers. A 15 foot pair of Monster Cable Original speaker wires carries a 2011 MSRP of $39.95. This is approximately 12 gauge, stranded copper wire in clear "Duraflex" insulation. I was given a pair of these cables years ago and, after cutting them down to nine feet in length (all I need), I have used them ever since. A similar length pair of 12 gauge zip cord "speaker wires" purchased locally at a hardware store should cost about half that. If you don't live close to a hardware store that sells 12 AWG line cord from a bulk spool in whatever length you need, or if you prefer the high priced spread, you can buy Original Monster Cable speaker wires online and have them delivered to your door. I certainly would not recommend more expensive speaker wire!